Learn how to care for your records by understanding the causes of deterioration and what you can do to prevent it. All deterioration is caused by the inherent nature of particular materials as well as by external factors. Deterioration caused by the nature of materials is known as Inherent Vice, while deterioration caused by external forces is is known as the Ten Agents of Deterioration. The following are some basic steps you can take immediately to reduce threats and extend the life of your records. Use acid-free paper: When creating important permanent documents such as minutes or reports, use acid-free, lignin-free paper with a minimum pH of 8.5 and a buffer of calcium carbonate of about 3% to supply alkaline reserves. Paper that is at least 25% cotton or rag will supply additional durability. See below for a list of vendors that sell archival-quality supplies. Minimize light exposure: Store records in an area without windows or skylights. If this is not possible, cover windows with dark shades or ultraviolet-filtering plastic films. Keep lights off when the area is not in use. Ultraviolet-filtering sleeves can be placed over florescent light tubes or special low-UV tubes can be used. Maintain environmental control: In general, keeping temperature and relative humidity low and stable will benefit all materials. High temperatures increase the rate of chemical reactions which cause deterioration. High humidity, generally over 60%, will cause mold to grow, metals to corrode, and encourage pest infestations, while very low humidity, under 20%, will cause materials to become brittle. Pollutants also interact with materials to encourage deterioration and infestations. However, not all formats require the same environmental conditions. Color photographs and films require very cold to freezing storage to prevent deterioration, while paper-based records generally benefit from temperatures below 70°F. It is much easier to maintain these conditions in storage areas that are not occupied by people. While the ideal is difficult to reach, the use of de-humidifiers, humidifiers, and air-conditioning can help maintain a good environment. Improve storage practices: Archival, buffered, acid-free storage enclosures are a great way to provide extra protection against damaging fluctuations in temperature and relative humidity. See below for a list of vendors who sell archival-quality storage supplies. 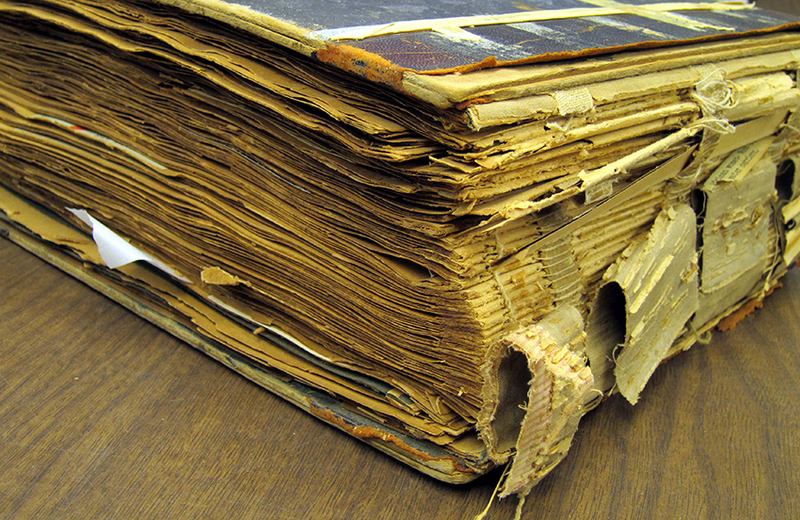 Handle permanent records with care: Do not curl, fold, or bend books and papers when placing them in storage. Metal fasteners (staples, metal paper clips, etc.) will rust and damage paper over time. Post-it™ notes and tape will leave an acidic residue on records. Note that PC(USA) congregations, mid councils, and national agencies can deposit their permanent records in the society's secure, climate-controlled archives for free and have their records digitized at a subsidized rate. The Northeast Document Conservation Center (NEDCC) provides free resources on preservation, including Preservation Leaflets, articles, curricula, disaster planning templates, and more. The National Park Service (NPS) provides free Conserv-O-Grams, a Museum Handbook, and other publications on preservation topics. The Conservation Center for Art & Historic Artifacts (CCAHA) provides technical bulletins on preservation topics. Heritage Preservation provides free downloadable resources as well as a store where you can purchase books and other collection care resources. The Institute of Museum and Library Services (IMLS) has created Connecting to Collections: A Call to Action, a multi-year, multi-faceted national initiative to raise public awareness and inspire action. IMLS provides free resources, a discussion board, and access to webinars through the Connecting to Collections online community. The following vendors provide archival-quality storage supplies.